The WLUFA AGM held on April 16 saw a large majority of members voting in favour of a dues increase from the current 0.95% to 1.1%, beginning on this coming July 1. The increase will be an interim measure, put in place to increase Association reserves to $1.5 million (in 2019 dollars) over the next few years. As was made clear to the members attending the AGM, once that target is met, dues will be returned to the current 0.95% rate as of the July 1 following the meeting of the threshold. David Monod, President of WLUFA, explained that increased demands for member services related to grievances and internal disputes, as well as the legal fees that accompany these, and the increased need for – and rising cost of – mediation and arbitration are some of the key factors affecting the need to strengthen WLUFA’s financial foundations. Additionally, Monod noted the effect of a current political climate that may make future bargaining of collective agreements more contentious than it has been in the past. In Monod’s words, “the best way to prevent a labour stoppage is to demonstrate to our employer that we are strong enough and united enough to sustain one”. 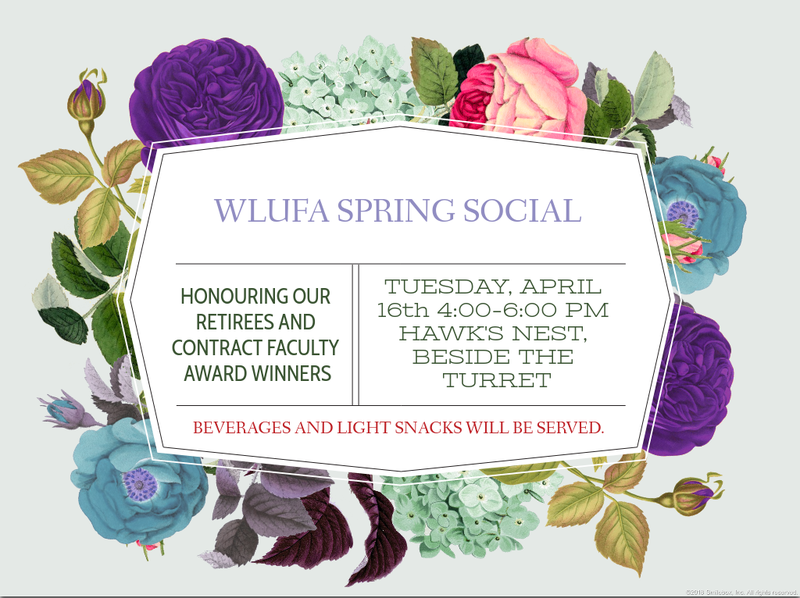 WLUFA Treasurer, Jim Gerlach, presented information on dues paid province-wide by other faculty associations and assured the membership that WLUFA – even with the interim increase – is still well within the provincial norm. Yesterday at Queen’s Park, Finance Minister Vic Fedeli brought in the Ontario Conservatives’ first budget of their new mandate. There were cuts of various sorts, particularly in social services, but in many ways it was gentler than people expected: the plan involves getting the budget to balance in five years, which frankly is what the Liberals probably would have done anyway (though they wouldn’t have got there exclusively by reducing the spend side). It’s not even a strict zero-growth strategy – though some expenditures are being cut for fiscal 19-20, heath, education and post-secondary are all expected to grow at least a tiny bit in the coming years (albeit in nominal terms, not real ones). There were six major points of note for the post-secondary sector. First, we finally found out the aggregate size of the OSAP cuts for next year, something the government resolutely refused to do back in January: it’s $671 million from projected 18-19 levels (though only $428 million from budgeted 18-19 levels because program costs were, as the government said a few months ago, running well ahead of expectation). Second, the government is promising to bring in measures to “improve faculty renewal” at universities, which basically means “we’d like to stop faculty over the age of 71, who are required by law to start drawing down their pensions, to ALSO stop drawing a full goddamn salary for a workload which is often significantly lighter than what the early career folks have.” I am not sure about the legalities of this – double-dipping is certainly annoying, but it would seem quite difficult to stop without the legislation being changed in such a way that undoes existing collective agreements – but it seems to me likely this quickly ends up in court. Universities and colleges will be cheering, because they’d certainly like to hire more younger faculty, but quietly because, let’s face it, this is not a fight they really want to get dragged into. Third, the government is promising an Expert Panel to deliver “an action plan for a provincial intellectual property framework and maximizing commercialization opportunities specifically related to the post-secondary sector” (they are talking research commercialization, if that’s not clear). When in doubt, study the problem, I guess. Not 100% sure what the province can do about this on its own – nearly all the legislative power around this is in federal hands as far as I know (I’m not a specialist in this area), but hey, I guess we’ll see. Fourth, there is a ton of stuff in here around reviewing apprenticeships and skilled trades (some of which was already announced, like increasing the allowable ratios of apprentices to journeypersons to allow greater throughput), a long-overdue redesign of ‘Second Career” (a McGuinty-era initiative to provide skills to laid off workers that never really met initial hopes), and a frankly flaky-sounding initiative to “provide better labour market information to job seekers”, which, you know, whatever. I have never seen an example of this kind of initiative having much of an effect on anything, but governments seem to like it. Fifth, on paper at least (though see below) no cuts to base operating funds. No increases either, but hey, small victories. But sixth – and this is the big one – the government wants to tie significant amounts of funding to performance outcomes – 25% starting in 2021 and increasing in stages up to 60% in 2024-25 (which, of course, is somewhat theoretical because it’s after the next election). These outcomes will be a subset of ten measures currently in the Strategic Mandate Agreements that each institution has with the government (currently the SMAs have 30-odd different measures; getting rid of the remainder is part of the “anti-red-tape” plan). This is – potentially – revolutionary. And certainly a very good example of a government getting at least partially serious about higher education, as I advocated back on Tuesday. In principle, its a good idea, to be applauded. But there are some enormous devils in the details. First of all, let’s give them credit for understanding some basics about good performance metrics. Although institutions are going to be measured on a set of common metrics (or almost common – my understanding is each institution will be allowed to pick one institution-specific metric to suit its own mission), institutions will not be held to a common standard on each metric. A “good result” for, say, graduation rates or graduate salaries (both likely outcomes measures) will not be the same for Algoma as it is as at U of T; rather, each institution will have some kind of target based on past performance. Moreover, it seems as though the plan is for institutions to get their performance measure based on some kind of “composite score” across all ten outcome measures, because the budget makes reference to institutions having the ability to “weigh the metrics so that they best reflect their own differentiated strategic goals”. This is all good stuff. There are two big challenges here, however, and I get the impression no one has really thought these through. The first and most important one is that the full financial implications of making 60% of grant funding (technically a bit less than this, because special purpose funds are excluded from the base) performance-based are not in the least bit clear. There’s two ways this could work. First, imagine the provincial budget allocates $3.5 billion to universities (and $1.5 B to colleges) and each institution gets a “notional” share based on students, as they currently do. Then 60% of that gets clawed back and each institution has to “win back” its share by meeting its performance target. Second, the government could allocate the $3.5B to universities (and $1.5B to colleges) as a whole and let them compete for it. In the latter system, if U of T has a bad year, and lost $100 million of its current allocation, that money would be available to others to win. In the former, that money goes back to the treasury and there could in fact be quite significant cuts in practice even though the budget says there won’t be. The second is that is that although giving each institution an independent target based on recent history sounds good, it does have the potential to somewhat penalize institutions that have done well lately (they will be given relatively hard targets) and favour the institutions which have done poorly recently (who will be given relatively easy ones). You can imagine how this will go: each institution will therefore try not so much to game the indicators as to game the actual initial targets and make them as low as possible and therefore easier to achieve (“oh man, it would be a total stretch for us to hit a 20% graduate employment rate, we’d have to work so hard for that”, etc.). The losers from this process could well simply be the ones least able to keep ministry expectations low. This is all going to make people very upset; and I’m not even mentioning how apparently one of the metrics the ministry may want to use are the results of how each institution’s graduates do on a set of PIAAC-like tests that HEQCO has been touting for awhile, which will outrage some people. So, expect both some hard-headed discussions about how to make these ideas workable at the same time as a lot of screaming about some specific metrics. And of course, to be ready for the implementation as part of the SMA discussions for 2020-21, this is all basically going to have to be decided over the next four months. Looks like a fun summer ahead. Why equity, diversity, and inclusion are still important on University Campuses? Old issues and new challenges. Why do we need to be aware of diversity, equity, and inclusion in this day and age? Why do we need to consider multiple marginalized identities in academia and beyond? Laurier is committed to providing accessible program. If you require an accommodation because of a disability, please contact accessibility@wlu.ca by April 5th.